Sew in love: Let's make Shiro-Tama Dango today! Let's make Shiro-Tama Dango today! This Sunday, we made Shiro-Tama Dango (White ball Dango). 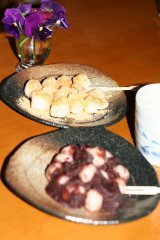 Dango is one of Japanese traditional sweets made of rice powder. Curious to know the recipe? It’s so simple and easy, but I wonder if you can buy the Shiro-Tama powder in your area. First of all, pour the one packet of Jyosinko (上新粉: rice powder) into a bowl and then add some warm water. Mix it up until it gets the hardness of earlobe. 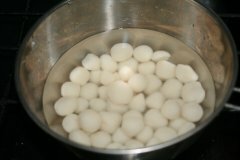 Make small balls about 2 – 3cm dia. Just like my daughter is doing in the photo! She did a great job on that. Put them into boiling water and wait until they pop out from the water. I’d say it takes about 3-5 min. or so. mmmm, that looks oishii! i think jyosinko is same as mochiko powder we have here in hawaii. by the way - your daughter is a cutie-pie! I have never seen this... it looks yamee!! Your daughter is sooooo cute!!! It's one of Japanese traditional sweets with rice powder! My daughter was so proud of herself as she did a great role! Yummy. And look at that little cutie pie face! Jade's so proud of herself!! Can you see that, eh? 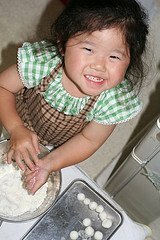 she makes a cute little helper in the kitchen! Oh, do Jade and I look alike? Some say she takes after her father. Now Jade is a good helper in kitchen. She does a lot of works! Hope you can find the powder! yum! its the same rice flour and its made the same like 'palitaw'! traditional philippine sweets, but the philippine ones are with fresh coconut, sugar and sesame seeds! cool :) i never tried them plain before (with the soybean flour) or with sweet black beans but will keep my mind open for other ways- i love the home goodie pics kumi! good luck at the handmade show ! You have similar flower in your islands? And thanks for your wishes on the show! I'm working on it right now! Just browse on by from browsing ismoyo. I should tell my Japanese boyfriend about the recipe. He's been telling me about dango recently and I have been piqued. And you know what? It's similar to chinese "tang yuen". 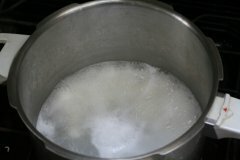 Glutinous rice flour is used though. And they are made for the Winter Soltice festival or so my mum says. Anyway, great to have found your blog! Thanks for visiting my weblog. I hope you can find the right kind of flour in your area!